These Yamaha SW118V Club Series V Subwoofers are ruggedly built to offer years of service. Gigging bands, mobile DJs, and houses of worship helped make the first 4 generations of Yamaha Club Series Speakers incredibly popular. The refinements of generation V continue this success story with larger enclosures for improved low-frequency performance, improved drivers for higher power handling, redesigned crossovers, stronger grilles, and dual Speakon and 1/4" connectors. With professional features, excellent sonic performance, and great value, Club Series loudspeakers deliver premium quality night after night. 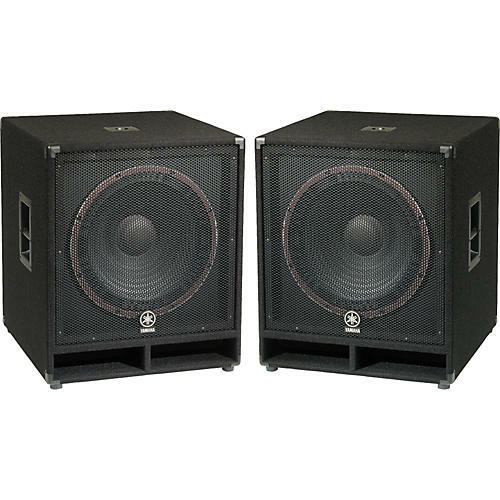 These SW118V enclosures house powerful 18" woofers with frequency responses of 30Hz-2kHz. 600W program handling, 1,200W peak. Sensitivity: 96dB. 22"W x 32"H x 25"D. 71 lbs.